I love the stories in this book! The only thing that nagged me a bit was the story "The Dhampir's kiss" and the first story in the collection, "Tangled Dreams". "The Dhampir's kiss" was a bit too sadistic for my liking but it was still well written. The first story in the collection was so good, I was disappointed that it left so many questions unanswered. All in all, a really great read and I would recommend to anyone over 18 years of age! So many of the stories make you feel that you are watching the events play out in front of you; as if you're in the story yourself. 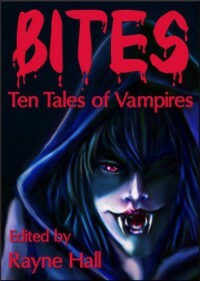 I also love the different takes on what a vampire is and what they are like by each author. I like seeing a different side, a more vulnerable side to vampires to the blood thirsty, soul less killers we see on TV. I will now go try to find the other books written by these authors and that's not something I do often asI am not easily impressed by authors. Thank you guys (and gals) for an awesome read!